If Mystery Science Theater ever featured cartoons, Shazzan would be a perfect pick. I never really got into Shazzan as a kid. This is probably due in large part to the fact that the show aired from 1967-69, nearly a decade before I was even born. And maybe it had to do with the fact that unlike many other classic Hanna-Barbera cartoons, reruns weren’t continuously on the air for decades after the show was first broadcast. But they can’t all be The Flintstones, can they? 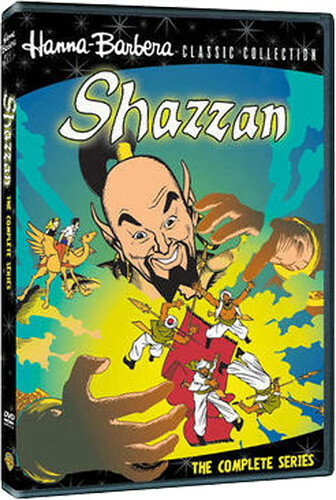 Anyway, the real reason I never gave Shazzan a fair shake, despite the fact that the show always seemed to have at least a somewhat loyal fan base, was the fact that it sounded way too much like Shazam! and as a dyed-in-the-wool fan of long underwear characters, I couldn’t abide a second-rate rip-off trying to ride the coattails of CC Beck and Bill Parker’s most famous creation, Captain Marvel. Never mind the fact that the two characters really didn’t have much in common… except for teenage protagonists, a magic word, and an ancient do-gooder who was practically a deity. But in reality, the two concepts are only tangentially related and now, years later, I’ve finally had the opportunity to give Shazzan a chance thanks to the Warner Archive Collection’s Manufacture-On-Demand service. All 36 episodes from the series’ two-year run are collected, as well as a short feature on the character. The series features two kids, Chuck and Nancy, who discover two halves of a magic ring. When they combine the halves and speak the name of the genie inscribed on them, the kids are transported to the fabled land of the Arabian Nights. The only way to get home is for the kids to seek out a wizard who lives “behind the beyond”. Luckily, they’ve got the help of the genie Shazzan and a flying camel named Kaboobie. Yes, Kaboobie. The show was created by the legendary Alex Toth (Herculoids, Space Ghost, Birdman, Super Friends) and features a smorgasbord of borrowed sound effects from Jonny Quest as well as a number of recognizable voices. Most notably, Nancy is Judy Jetson. I mean - it’s almost impossible to watch because every time she speaks, you’re hearing those little whirring cars in the background, even though the story takes place in the past. Or maybe that’s just me. Anyway, Shazzan is a lot like other cartoons of the era in that pretty much every episode is exactly the same. It goes like this: An evil wizard finds out about the rings and wants to steal them. Said wizard (or his monstrous cohorts) chases the teens through a city background that repeats itself every five seconds or so. Either Chuck or Nancy gets locked in a cage for maybe five minutes. The camel gets them out (or they manage to find some other way to escape), they combine the rings and Shazzan shows up to save the day. And when Shazzan shows up, it’s just no contest. There’s no real sense of danger because he is so immensely powerful and can do pretty much anything you can imagine. Like the Old Testament God, Shazzan is not only all powerful, he cruelly punishes evildoers and mocks the villains in the midst of their suffering. It’s bad enough being punished for your sins by getting turned into a swine - having to listen to a 50-foot man in Zubaz pants and an open vest laughing at you while he does it? I’d rather be turned into a pillar of salt, thank you very much. For some reason, I kept imagining Dwayne “the Rock” Johnson playing the role of Shazzan, perhaps because they both share an abundance of ego and enjoy taunting their opponents before and after utterly destroying them. All of that being said, I can’t say that I didn’t enjoy Shazzan: the Complete Series on some level. For one thing, it does feature Alex Toth design work, and that’s almost worth the price of admission right there. While it’s probably impossible to watch a series in marathon-viewing style (trust me, I tried), I won’t deny that I found myself with a smile on my face more often than not while viewing. It’s the type of cartoon that deserves to be mocked in the company of friends, MST3K style. You could very easily turn it into a drinking game, assuming you’re planning on making it an early night and don’t have anything important to do the next day. And though the plots are incredibly simplistic (almost non-existent), Shazzan is the kind of show which piques the mind and leaves many unresolved questions such as: Did Chuck and Nancy ever get home? Why didn’t anyone notice two white kids in 1960’s attire running around the “mythical land of Arabian Nights”? And why does that camel sound so much like Scooby-Doo?